Our guide book was "Walks in Volcano Country" by Alan Castle, published by the Cicerone Press. As far as scenery goes this was the most spectacular day of the walk. And it showed France at its best in so many ways. We went from one good but cheap hotel to another similar. The people at the hotel in le Claux were far kinder than they needed to be. And the weather was superb! We were so impressed that we returned to the hotel in 2000 and had another meal. And we walked from Pas de Peyrol to Puy de Peyre Arse. 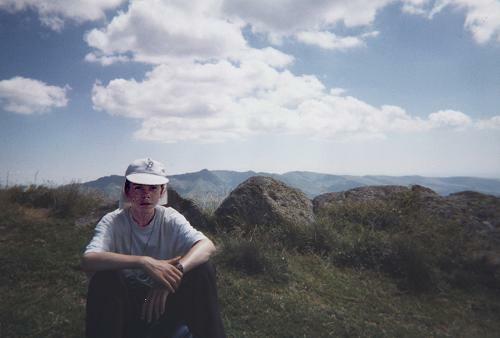 And, on another day, walked from Super-Lioran to Puy Griou. See here. Got up, had breakfast, went through the village to the shop where we got some bread and fruit, packed and paid the hotel. We got the hotel to phone a taxi but we were told it would be an hour. So we waited. While waiting I bought myself a T shirt - Sapeurs et Pompiers de Le Claux - there won't be many of that around the gym! And a coffee and lemonade. Still no taxi. The hotel phoned again - no taxi’s available! So one of the women of the hotel drove us to Pas de Peyrol in her own car for free! It was very good of her and of the hotel. Le Peyre Arse Hotel and Restaurant is a modern and very comfortable hotel. I hope to stay there again as it is in a part of France I want to explore more. And the staff were lovely. 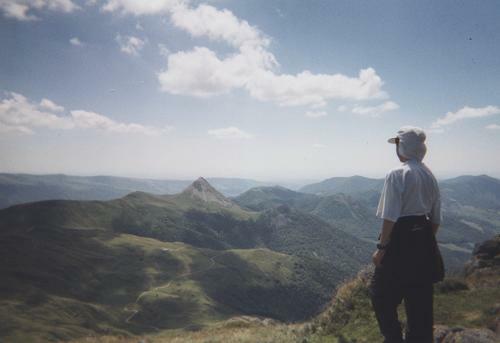 At the Pas de Peyrol (just below Puy Mary) I bought a disposable camera for 55F - it takes 27 photos. If it can’t take decent photos today (bright and sunny) it won't take them any time. 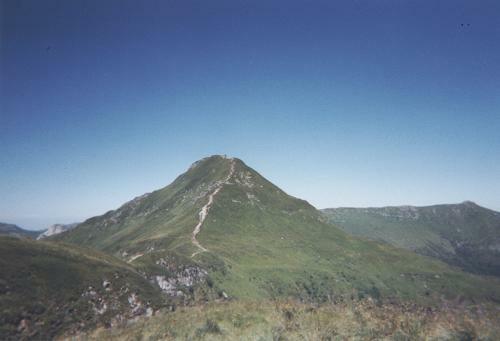 We went up Puy Mary - there is a concrete path all the way to the summit. Hordes of tourists but lovely views. We started walking at 11 and got to the top at 11:25. 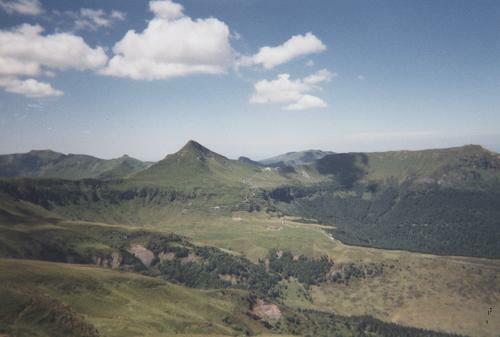 Pas de Peyrol must be on the route of every tour bus in the Cantal. It is a superb place to stop with fantastic views down the valleys which meet there. 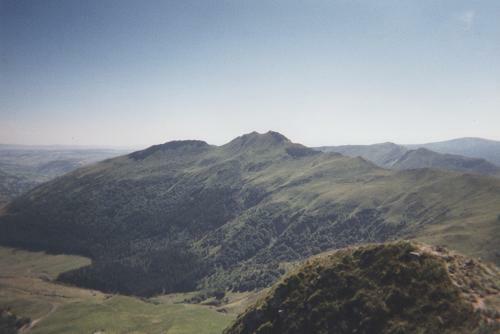 The views are even better from the top of Puy Mary. 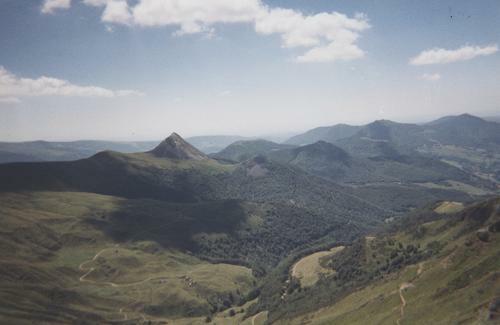 Apparently Puy Mary is named after a Roman governor of the Auvergne - Marius, who converted the area to Christianity in the third century. We had intended to take the (non-appearing) taxi to the Col de Serre but, because we were so late in setting off we asked our chauffeuse to take us to the Pas de Peyrol. There was no shortage of cars at the Pas. 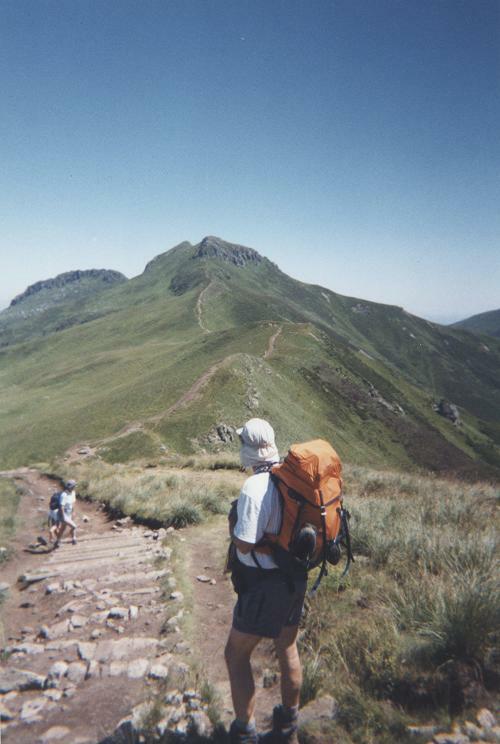 But few of the tourists went beyond the Puy Mary summit. We then set off for Puy de Peyre Arse. It’s a difficult path - very pebbly and steep, but route finding is easy - especially in hot, bright, sunshine. 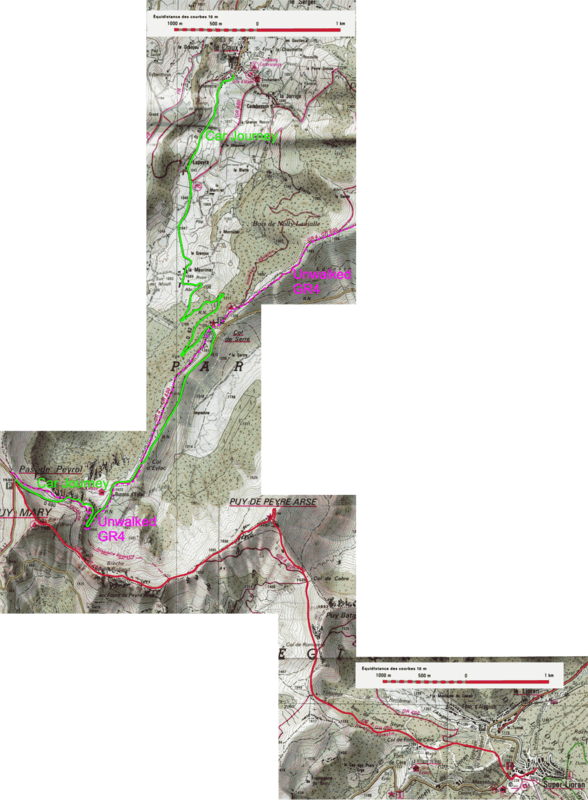 We negotiated the Breche de Rolland without difficulty and, after lunch, got to Peyre Arse about 2. The Breche de Rolland might be difficult in snow and ice, but in the conditions we had it was no problem. You have to use some handholds but if you can manage a flight of stairs you can do the Breche! 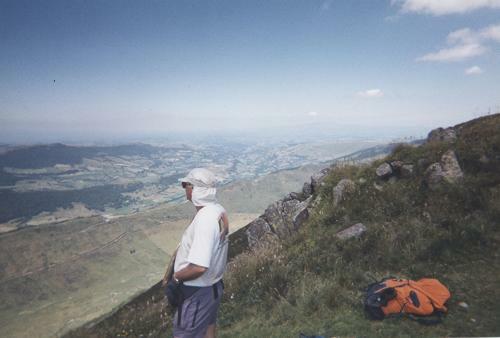 I found walking down from Puy Mary more difficult - I always thought I was about to land on my bum! Today was a beautiful walk through some of the most spectacular scenery of the holiday. And it was complimented by some wonderful weather. Even lower down, walking through the woods was a delight - lots of pine smells. We were rather tired and decided to miss out Puy Griou. 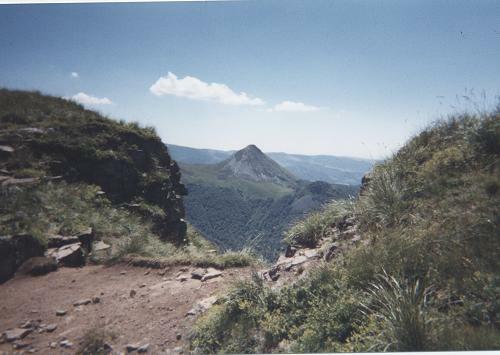 (In 2000 we climbed Le Puy Griou - there are some pictures here.) We went down to Super Lioran, found the Tourist Office, who told us where the hotels were and gave us a train timetable. By 4:30 we had a room and we were soon unpacked, washed and snoozing. We ate in the hotel at 7:30 - very good - even tomato ketchup for A’s steak and chips. We had a walk around town afterwards, looked at the crazy golf and so to bed. Super Lioran is another of the purpose built mountain resorts. Quite busy in summer but it looks as if it would be extremely busy in winter. I wish that skiing resorts and facilities were not so assertive. There are more photographs of this walk, taken in 2000, here.